majorette is your booster blush. Wear this peppy pink-peach shade alone or under your favorite blush for an instant "pep-up." It's time to rally & rouse those cheeks! Twirl, tap and blend the perky color onto the apples of your cheeks with fingertips to look pom-pom pretty! 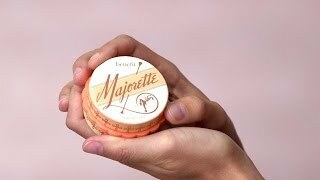 For extra pep and staying power, wear majorette under your favorite Benefit box o' powder. Hurrah! The peach & pomegranate fragrance is chock-full o' cheer!